A positive communication for missed family connections. If you have purpose to call on families you will quickly learn that every effort does not result in face-to-face connections. These tool can let families know that YOU were there, invite them to call you, and to share a brief personal communication. The carbon style also gives visitors documentation of those missed opportunities. These cards are ready to hang, die-cut communication tools. They are printed on card stock in highly visible colors. Single sided card; printed message on the front –write a message on the back. 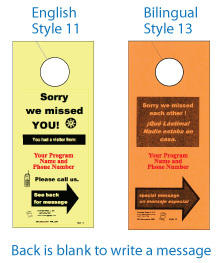 Door hangers have been designed with an area for your programs contact information to be shared. It is essential that your program name and number be provided to allow family follow-up. 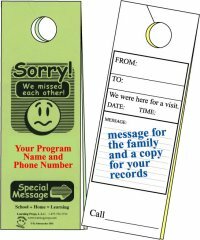 Your program information printed on pre-designed door hangers, they arrive ready to be used. Door hanger cards have 2 message pages attached. Top card has space for your program information. Write a personal message to the family on 2nd page. One page for the family and a copy for your records. Remove bottom layer, which is a carbon copy of the message left documenting message and attempted visit. Blank area for you to write, stamp or attach stickers that you create. Ready for you to place on the door hangers. Your program information printed on pre-printed door hangers with a letter press. They arrive ready to be used.